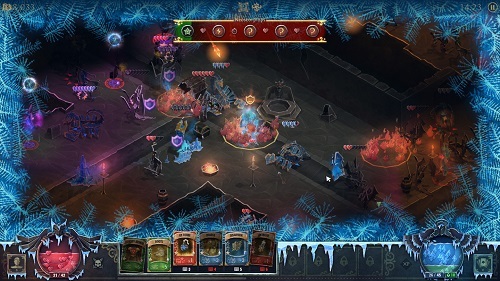 If you took the deck building out of your favourite card game and mixed it with a Diablo 1 type hack and slash the result would be Book of Demons. Not only does this take on a traditional fan favourite offer hours of fun it also does so in a comedic and visually appealing way. Offering the 3 characters that you’d expect to see (warriors, rogue and mage) you’ll venture down into the labyrinth underneath a small town on the verge of the end. Within the town you’ll meet the typical characters including the wise sage who can turn the unidentified into potentially your next upgrade. While on the surface these characters are nothing unique the paper art style, conversations and touch of parody make them interesting to engage with. Most of your time though is spent underground hacking and slashing your way through the randomised level layouts. This is where the unique take on a classic game continues. Notable mechanics include predetermined branching paths through the dungeons which makes exploring every inch of the level easier and combines with mini bosses, various monster types and shrines waiting to offer up their goods to worthy heroes. The predominate gameplay sees you guiding your hero along said paths to clear out enemies for experience points and gold. While your character will automatically engage enemies in their field of view, additionally damage can be activated by mashing that mouse button or (thankfully) holding it down instead. To enhance your basic attacks you’ll rely on your customised deck of cards which fall into the three broad categories of artifact, item and spell. Artifact cards are your items which lock away a portion of your mana for passive benefits; items can heal the player, deal damage or return them to town and finally spells let you enhance your normal attack to deal elemental damage, stun enemies and various other effects. Found randomly around the dungeon and able to be upgraded as you progress mixing and matching these cards is the strategic lever offered by Book of Demons. Do you opt for powerful artifacts that leaves you without mana for spells? Or do you pack the most powerful attacks you can and forego artifacts entirely? That choice is yours but you’ll also need to adapt to what you find throughout the dungeon at the same time. When all is said and done Book of Demons has this impressive ability to be nostalgic to Diablo fans but also friendly to newcomers, particularly with the paper theme and touch of light-hearted design principles. Relive the Diablo experience in paper art style. 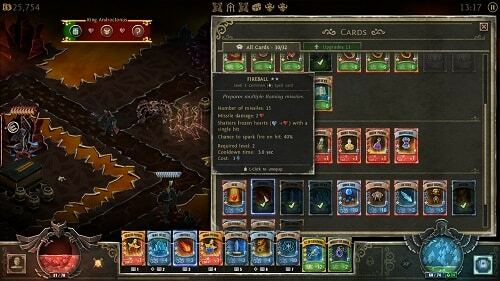 Build your own deck of cards from artifacts, items and spells. Play as a warrior, mage or rogue. Gossip with townsfolk, identify cards and upgrade them. Customise your deck as you manage risk/reward mechanics.